Use this webpage to answer the question found on your worksheet and prepare to make your presentation. State Democritus’s ideas about the atom. Explain how Thomson discovered electrons. Describe how Rutherford found the nucleus. As we've talked about in class, atoms are tiny and too small to see with the unaided eye and with most microscopes. Only the scanning tunneling microscope (developed in 1981) has allowed us to almost "see" atoms, and then scientists saw the electron orbital of a hydrogen atom in May 2013. However, even before the development of the scanning tunneling microscope and the photoionization microscope many scientists throughout the ages have performed experiments to give us more and more understanding of what atoms look like. In the following paragraphs and videos, you will learn about the scientists that have made crucial discoveries that have led to our current understanding of the atom. The history of the atom begins around 450 B.C. with a Greek philosopher named Democritus. Democritus wondered what would happen if you cut a piece of matter, such as an apple, into smaller and smaller pieces. He thought that a point would be reached where matter could not be cut into still smaller pieces. He called these "uncuttable" pieces atomos, which means "indivisible". This is where the modern term atom comes from. Democritus was an important philosopher. However, he was less influential than the Greek philosopher Aristotle, who lived about 100 years after Democritus. Aristotle rejected Democritus’s idea of atoms. In fact, Aristotle thought the idea of atoms was ridiculous. Unfortunately, Aristotle’s ideas were accepted for more than 2000 years. During that time, Democritus’s ideas were more or less forgotten. Around 1800, a British chemist named John Dalton revived Democritus’s early ideas about the atom. He made a living by teaching and just did research in his spare time. Nonetheless, from his research results, he developed one of the most important theories in science. Dalton did many experiments that provided evidence for atoms. For example, he studied the pressure of gases. He concluded that gases must consist of tiny particles in constant motion. Dalton also researched the properties of compounds. He showed that a compound always consists of the same elements in the same ratio. On the other hand, different compounds always consist of different elements or ratios. This can happen, Dalton reasoned, only if elements are made of tiny particles that can combine in an endless variety of ways. From his research, Dalton developed a theory of the atom. All substances are made of atoms. Atoms are the smallest particles of matter. They cannot be divided into smaller particles. They also cannot be created or destroyed. All atoms of the same element are alike and have the same mass. Atoms of different elements are different and have different masses. Atoms join together to form compounds. A given compound always consists of the same kinds of atoms in the same ratio. Dalton’s theory was soon widely accepted. Most of it is still accepted today. The only part that is no longer accepted is his idea that atoms are the smallest particles. Scientists now know that atoms consist of even smaller particles. Dalton incorrectly thought that atoms are tiny solid particles of matter. 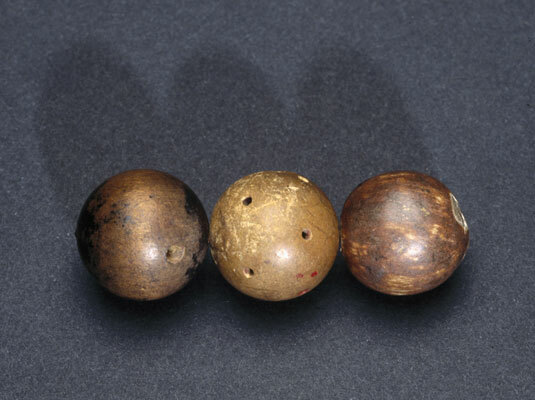 He used solid wooden balls to model them. The picture below shows what Dalton’s model atoms looked. He made holes in the balls so they could be joined together with hooks. In this way, the balls could be used to model compounds. When later scientists discovered subatomic particles (particles smaller than the atom itself), they realized that Dalton’s models were too simple. They didn’t show that atoms consist of even smaller particles. Models including these smaller particles were later developed. The next major advance in the history of the atom was the discovery of electrons. These were the first subatomic particles to be identified. They were discovered in 1897 by a British physicist named J. J. Thomson. Thomson was interested in electricity. He did experiments in which he passed an electric current through a vacuum tube. This is the cathode ray tube (vacuum tube) that Thomson used. The dashed line indicates the expected path of the electrons, how he discovered that the electrons actually followed the solid line path in the picture about. His conclusion was that atoms must have negative subatomic particles, which we now know as electrons. Thomson knew that atoms are neutral in electric charge. So how could atoms contain negative particles? 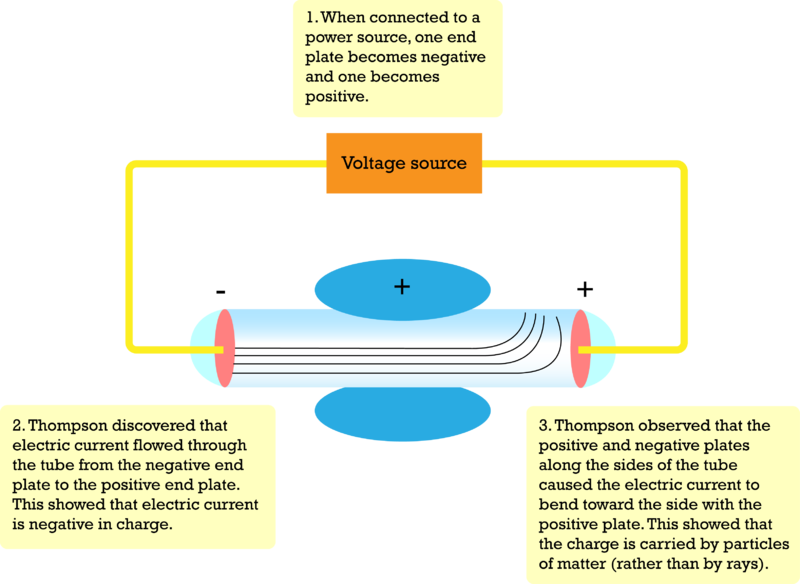 Thomson thought that the rest of the atom must be positive to cancel out the negative charge. He said that an atom is like a plum pudding, which has plums scattered through it. 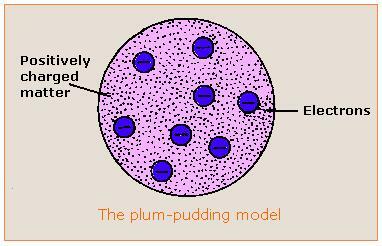 That’s why Thomson’s model of the atom is called the plum pudding model. It shows the atom as a sphere of positive charge (the pudding) with negative electrons (the plums) scattered through it. Here in America we don't generally eat plum pudding so you can think of his model as the "Chocolate Chip Cookie" model. The chocolate chips are the electrons and the cookie is made of positively charged particles, later known as protons. A physicist from New Zealand named Ernest Rutherford made the next major discovery about atoms. He discovered the nucleus. In 1899, Rutherford discovered that some elements give off positively charged particles. He named them alpha particles. In 1911, he used alpha particles to study atoms. He aimed a beam of alpha particles at a very thin sheet of gold foil. Outside the foil, he placed a screen of material that glowed when alpha particles struck it. If Thomson’s plum pudding model were correct, the alpha particles should be deflected a little as they passed through the foil. Why? 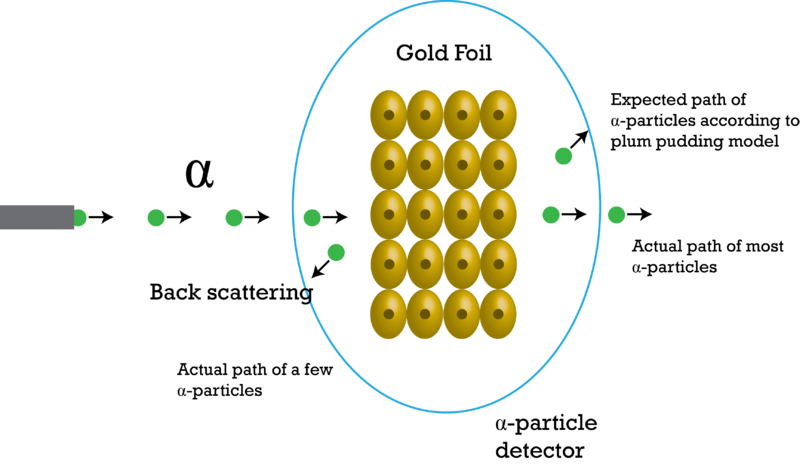 The positive "pudding" part of gold atoms would slightly repel the positive alpha particles. This would cause the alpha particles to change course. But Rutherford got a surprise. Most of the alpha particles passed straight through the foil as though they were moving through empty space. Even more surprising, a few of the alpha particles bounced back from the foil as though they had struck a wall. This is called back scattering. It happened only in very small areas at the centers of the gold atoms. Based on his results, Rutherford concluded that all the positive charge of an atom is concentrated in a small central area. He called this area the nucleus. Rutherford later discovered that the nucleus contains positively charged particles. He named the positive particles protons. Rutherford also predicted the existence of neutrons in the nucleus. However, he failed to find them. One of his students, a physicist named James Chadwick, went on to discover neutrons in 1932. Niels Bohr proposed the Bohr Model of the Atom in 1915. Because the Bohr Model is a modification of the earlier Rutherford Model, some people call Bohr's Model the Rutherford-Bohr Model. 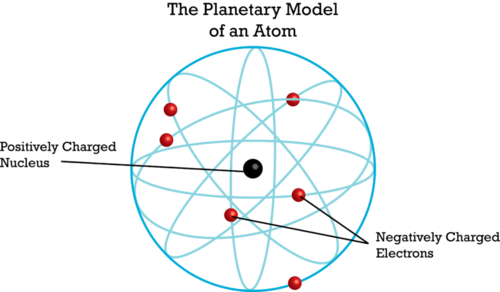 The modern model of the atom is based on quantum mechanics used to create his model. Basically, he discovered that electrons exist in different "shells" or levels around the nucleus, based on their energy levels. In our class we won't make you draw the different energy levels, but you will when you get to high school. Around 450 B.C., the Greek philosopher Democritus introduced the idea of the atom. However, the idea was essentially forgotten for more than 2000 years. In 1800, John Dalton re-introduced the atom. He provided evidence for atoms and developed atomic theory. His theory is essentially correct. However, he incorrectly thought that atoms are the smallest particles of matter. In 1897, J.J. Thomson discovered electrons. He proposed the plum pudding model of the atom. In this model, negative electrons are scattered throughout a "sea" of positive charge. In 1911, Ernest Rutherford discovered the nucleus. He later discovered protons as well. Rutherford thought that electrons randomly orbit the nucleus. In 1915, Niels Bohr discovered that electrons orbit the nucleus in different but specific levels or "shells" based on their energy levels.